Stereophonics lead guitarist and singer, Kelly Jones, uses the Boss BF-3 Flanger Pedal in his guitar pedalboard. #ProductDemo In this video, Vai discusses perfect pedal order, and uses the flanger at 13:30. He recommends experimenting with the flanger's placement in the signal chain to find a sound you like. Top-right corner, the purple-ish Boss pedal is a Flanger. At 21:40 you can see the Boss pedals (BF-3, TR-2, CH-1, GE-7) he is using alongside the Dunlop Cry Baby wah pedal. Brad Delson, Linkin Park guitarist, uses the Boss BF-3 Flanger Pedal on his pedalboard at 2:25. "The DD-7. I love it. Right now I use two of those, a [BF-3] flanger, a [TU-2] tuner, and my wah. That’s it in my board right now—pretty simple," says Mike, in [this interview](http://www.bossus.com/community/boss_users_group/1220), with Boss. "Yeah, and I like the DD-3 also. It’s a good one — y’know, if it ain’t broke, don’t fix it! I use the flanger [BF-3] a little bit, and I’ve been using the Super Overdrive [SD-1], the yellow one." Seu set atual varia um pouco entre seu projetos solos Maquinado, Almaz e Nação Zumbi. 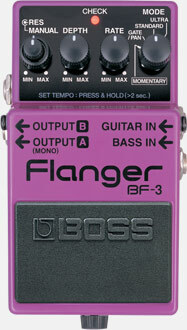 According to Reverb's website, his current list of pedals also includes the Boss BF-3 flanger. Again, from the Tone King video on Jeordie's effects and amps. The fact that he is using a BF-3 can be seen by the presence of a second, unused, stereo output jack on the left side of the pedal (which, interestingly, the output being used is the Output B, instead of the mono Output A). At 10:18 Zach Blair, the lead guitarist of Rise Against, lists Tim's pedal and says that he uses a boss delay and places his hand on a boss flanger. Although he says boss delay the pedal is clearly a boss flanger as you can tell from the colour. In this Rig Rundown Shaun Morgan talks about his equipment for upcoming Seether Tour. His pedalboard can be seen 4:46 into the video, with Boss BF-3 on it. Picture was taken by me at Seether's Cleveland show at the House of Blues on May 12th, 2015. Though the picture may be slightly blurry, it's clear that is what the pedal is. I got a better look in-person. According to the Reverb's website, Felder's pedalboard for "Hell Freezes Over" also included the Boss BF-3 flanger pedal. In this diagram made by Boss, the Boss BF-3 pedal can be seen in the left corner. At 1:35 of this private gear tour, Stephen Carpenter of [Deftones](http://equipboard.com/band/deftones) shows off some of his gear, including a Boss BF-3 Flanger Pedal. This interview states that Collins uses this pedal. In this image of Bruce Springsteen's pedalboard, his Boss BF-3 Flanger can be seen. Photo originally from the [MESA/Boogie's website](http://www.mesaboogie.com/artist/bruce--springsteen.html). 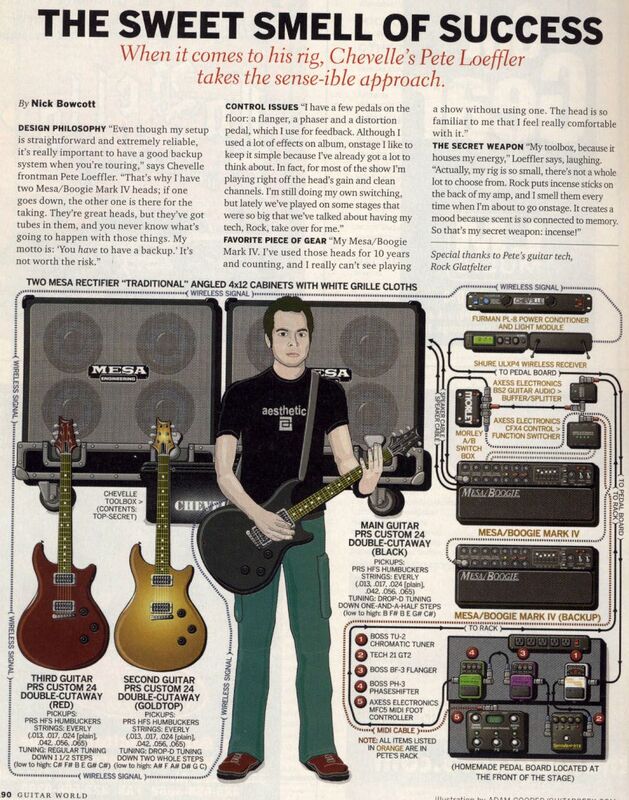 This flanger appears on his rig rundown from Guitar World Magazine. As listed among the gear in this website. "I’m having a custom pedalboard developed as we speak, which will include a [BD-2] Blues Driver, a Flanger [BF-3], a DD-3 Delay, and a Reverb pedal [RV-5]." The Chrous, Super Flanger, and Bass Overdrive pedals are mostly used for noise and interludes during Full Of Hell's live sets. Hazard has used the flanger on “Bone Coral” from Rudiments. These pedals were all also used on the Merzbow collab in non-conventional ways. Hazard had the flanger and super chorus running through a contact mic, which He then taped it to a cymbal for one track and to a floor tom for another. According to Tim Grime's photo, Koppes used Boss BF-3. The Boss BF-3 Flanger Pedal can be seen in this Facebook photo of Charlie's studio. Seen to the left of the tremolo. En el minuto 1:37 de la versión en vivo (del disco Pastel) de "Plástico", se puede ver el pedal en la pedalera de Paco. Building on the 20-year legacy of the famous BOSS BF-2, the new BF-3 flanger pedal gives guitarists and bassists an updated version of the classic BOSS flanger with the thickest stereo flanging sounds ever. Two new modes (Ultra and Gate/Pan) create stereo flanging with incredible depth--even Slicer-type effects and sounds that seem to "swirl" around the listener. An instant classic. ...and it doesn't sound anything like as good as the BF-2. This is a digital flange effect with none of the mystery, depth and vibe of its predecessor. Just get that instead. see, their updated phaser is a great pedal, totally unappreciated, awesome new features! but who sues an 80s boss phaser anyway? When i think phasing I don't think of Boss. But the BF2 was so iconic they shoulda made it until the end of time, unchanged. Yes, I've noticed how good the PH-3 sounds on demos online. It can offer some truly 21st Century phasing effects with its upwards and downwards modes and its step filter. It can also do a sort of almost pseudo wah on lead lines if you crank the resonance. I think that might be my next BOSS pedal, actually, as it makes a change to the MXR/Small Stone thing, and no-one is really using the PH-3, so it's a good way of sounding different. Graham Coxon's got one though: he knows! its a little killer, got oen a little after it came out after my friend's little brother let me try his. He got one just because he was into all thigns Boss but iw as like "step LFO!" Does everything I want it to, is easy to use, never breaks or craps out! The tap function on this one works really well, I can use it mid song without any major difficulties. Nice to have the stereo option too. It's one of those pedals you kind of like to have and like to use but not too much because you really can't fit it in every song. But I like the waves it makes, so... nice. Flanger to get the job done! The BF-3 is a great digital flanger that is easy to set up (given you play around with the settings for an hour maybe first). The buffer in the BF-3 can cut a bit of your highs off in the clean sound, but with overdrive and distortions you wouldn't notice it, I recommend throwing the BF-3 in the amps effects loop or even putting it in a true bypass loop to protect your 'Tone'. I played through other flanger pedals and this one is the one that can do Flanging and other modulation effects the best! the gate/pan mode can be used as a Tremolo in mono and sorta a Uni-vibe in stereo amp setups. the ultra mode is great for wacked out Flanging. But the Standard mode and momentary mode (which is standard mode with, well the momentary application) is where this pedal sits better for my application, if you set the 'Res' knob low and the 'Rate' knob high you can easily get chorus sounds, even Phaser with the right settings. If you're unsure where to start with your modulation pedal search, I recommend the BF-3 or any flanger with (a manual knob which is essentially the delay time), even if flanger isn't your thing, you can cop some other modulation pedal sounds from this one effect alone. It doesn't get better than this! This pedal have been on most pedalboards out there... I grew up seeing lots of players, both guitarists and bassists, using this pedal. It sounds amazing, and compared to the BF-2 (which I have owned before) it gives you more options to fine tune your effect. I love the "Momentary" function, specially to emphasize some phrases during solos. An amazing effects pedal! It takes a bit of time to find the sound you want but it's well worth it. BF-3 is a pretty rad little guy.. does its job, stays out of trouble, yeah. I'm happy with this pedal and its new options, in general a very simple and good pedal. Early birthday present in 2018. Changed bass playing for me. Justin Chancellor. Forty-Six and 2. Incredible. Im strictly Boss pedals with some exceptions like whammy pedals. This along with every Boss pedal I've ever bought has been amazing.